Since Thanksgiving is all about so many heavy dishes, such as mashed potatoes, gratin and gravies, it’s always nice to have a little bit of green at the table. These beans are the perfect palate-cleansing side, providing that clean, acidic sweetness, much like the cranberry sauce. The citrus just pops and will refresh the senses in between spoonfuls of sweet potatoes and turkey. Best part, serve them room temperature, which means you can make them up a few hours ahead and not worry about getting them to the table hot. In fact, I’m betting these could be made the day before, refrigerated in the dressing, and re-tossed right before dinner is served. They are outstanding and a recipe I will use all year. Bring a large pot of salted water to a boil. Fill a large bowl with ice and cold water and set nearby. 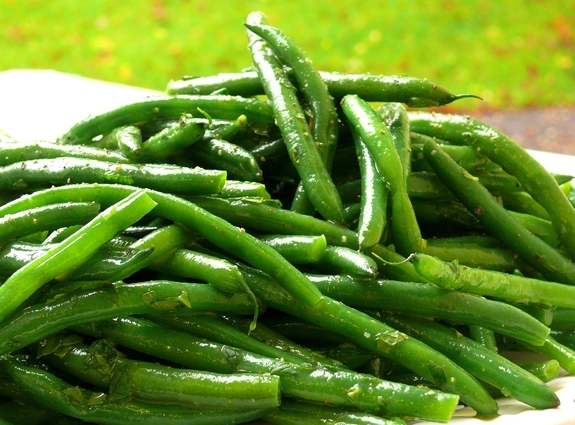 Drop the green beans (I like to do mine in batches) into the boiling water and blanch for 3-4 minutes, or until bright green and crisp tender. 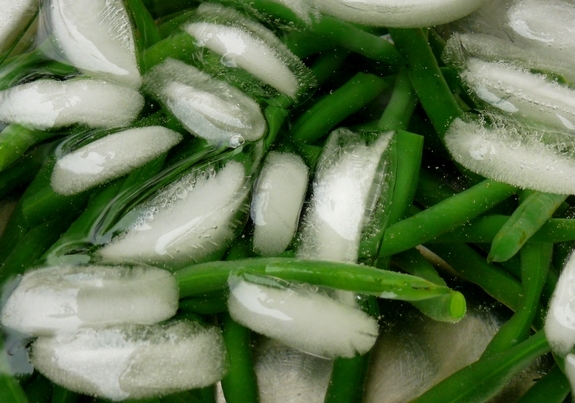 Remove the beans from the water and immediately plunge them into the ice water. When the beans are completely cooled, drain them, then spread on a kitchen towel and pat dry. 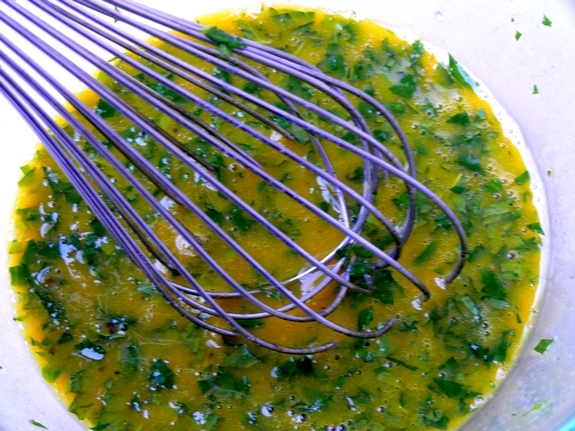 In a small bowl, whisk together the orange juice concentrate, mint, vinegar and mustard. Season well with salt and pepper. 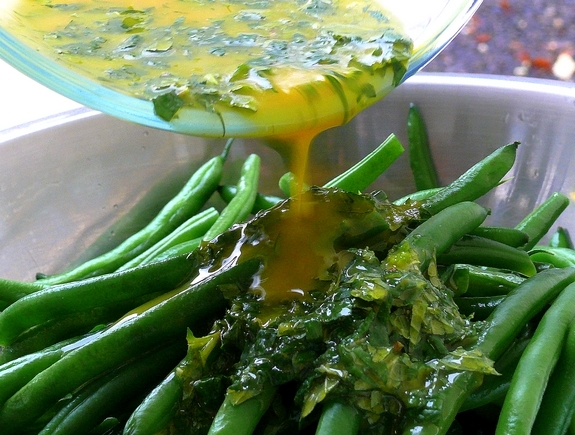 In a large bowl, gently toss the beans with the vinaigrette. In a large bowl, gently toss the beans with the vinaigrette. Serve room temperature. This looks so good! Perfect timing, too, as I have been asked to bring a vegetable side to Thanksgiving dinner! Thanks for all your delicious recipes. What a refreshing side dish idea! oh my gosh, yes!! 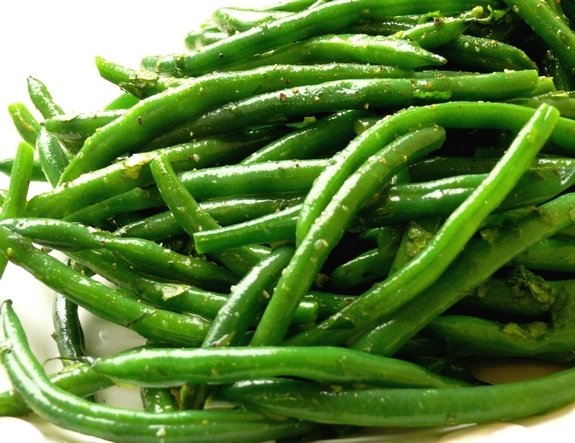 i was looking for a non-creamy green bean dish for thanksgiving and this is perfect. also, i love your purple whisk! I love green beans and cook them all the time in so many ways but this I have not heard of, cannot wait to try! Orange good but interested in the mint flavor. Could a fresh orange juice reduction be used instead of concentrate? How many servings does this make? I’d love to make this for a large neighborhood dinner but have no idea how many batches I’d need!